SlayerCon 2 | The Fighting 1:18th! Slayer Design Studios will be holding their 2nd SlayerCon this March. SC2 will be held at the Ramada Inn located in Edgewood, Maryland. The Con kicks off with a meet and greet dinner Friday March 2nd at Famous Dave’s with the official Con running from Saturday March 3rd through Sunday March 4th. It will cost $10.00 upfront to attend. This money will be used to buy lunch for the main day, Saturday. This money will also provide snacks and drinks. If you would like to set up a table, it will be a $10.00 table fee, and you can have 2, 6 foot tables for that price. One of the Fighting 1:18th’s Founders Fogger1138 will be attending the Con to provide insight and coverage. 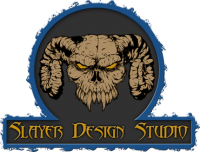 If you would like more information on SC2 you can visit SlayerDesignStudio.com or chat with SlayerDave. Great insight into a customizing professionial. Enjoyed the interiew cuz I had never heard of Slayer or his company before a few months ago.Thanks Fighting 1:18th for that!! !